I’ll never forget the day I chased poor Ted around our condo, cat carrier in hand. I finally managed to corner the poor guy in a bathroom, turned the carrier on end and dumped him in head first. Ugh… What a way to begin our trip to the vet. No wonder he got so carsick on the way there. I’ve learned a lot about getting a cat into a carrier since then. These are some of the lessons my cats have taught me about getting a cat into a carrier. Lesson number one is to never chase the cat. Chances are you won’t catch him, and if you do, you’ll get scratched. There are easier, less traumatic ways of getting a cat into a carrier. Here are eight tips. 1. Make sure the carrier is the right size for the cat. He should be able to stand up, or at least stretch out and turn around. A bad experience will be even worse if the cat is cramped and uncomfortable. 2. Leave your carrier out and open all the time. Put a towel inside and sprinkle catnip on it. Your cat will decide it’s a great place to take a nap. There’s another benefit to leaving your carrier out all the time, too. When it’s time to get your cat into a carrier, you won’t warn him that something bad is about to happen by rattling the carrier around as you’re dragging it out of the closet. 3. Use a top loading carrier. Getting a cat into a carrier is easier if you can just drop him in through the top instead of trying to force him through a narrow door. 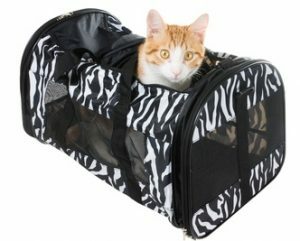 If you have a soft-sided carrier, make sure the opening on top is long enough and wide enough to get your cat in easily. If you have to squish the cat to get him in, the carrier’s too small. 4. If you need to use a carrier with a door on the side, prop the carrier against a piece of furniture and stand it on end. Then drop the cat in, back legs first. 5. When it’s time to go somewhere, take the carrier to the cat. Have the door open, so all you have to do is put him inside. If you pick the cat up and carry him into the room where the carrier is, he’s sure to know something’s up and squirm out of your arms. 6. Spray Rescue Remedy inside the carrier before you put the cat in. This homeopathic remedy causes no side effects and won’t make your cat feel or act like he’s drugged. But it will take the edge of his anxiety. 7. Tell your cat where you’re going. It’s okay to say you’re going to the vet, as long as you add that the vet loves cats and will be so happy to see him again. 8. If all else fails, confine your cat to a small space, like a bathroom. Put the carrier in the bathroom first. If you’re using a carrier with just one door on the side, stand it on end. Then gently wrap the cat in a towel and put him in feet first. Some of the worst tragedies occur when a cat gets out of a carrier far from home. Here are some ways to keep your cat safe on the road. Never use a cardboard carrier. A frightened cat can claw through the side or force the top open and get out. Read customer reviews before buying a carrier to make sure it’s sturdy. Pay special attention to reviews of soft-sided carriers. Cats can claw their way out of some. Pull on the doors to be sure they’re closed securely. If the top and bottom of the carrier snap together, also tug on the snaps to make sure they’re actually closed. When carrying your cat in a hard-sided carrier that separates into two pieces, hold the handle with one hand and rest the bottom of the carrier on your other arm. Your cat will be more comfortable, and the top and bottom won’t separate, allowing the cat to get out in the vet clinic or grooming shop parking lot. If you’re going to let the cat out of the carrier on a long trip, he’ll be safer if he’s wearing a harness and leash. Keep the car windows closed. When you stop for a break, put the cat back in the carrier before opening the car doors. Please microchip your cat. If he gets out of his carrier, that chip could be his ticket home. Getting a cat into a carrier and keeping him safe doesn’t have to cause major trauma for either of you. If you’re calm, upbeat and let the cat know where you’re going, he should go into the carrier easily and sleep for most of your ride.